Green and Glassie: Pumpkins ... Did you know? Pumpkins ... Did you know? Beta-carotene, the antioxidant that makes pumpkins orange. Carotenoids are plant pigments that help neutralize free radicals in the skin to slow down the aging process and prevent wrinkles. Vitamin A, a powerful natural antioxidant vital for keeping your eyes, bones and teeth healthy. B Vitamins, a good source of folate and niacin which helps protect against certain birth defects. Vitamins C, E, and K. Vitamins that support cell reproduction, tissue repair and fetal development; protect against osteoporosis; fight disease-causing free radicals in the body and even help your blood clot. Essential minerals, like calcium, potassium , phosphorus and copper. Packed with fiber, to keep you regular and in tip-top digestive shape. Did you know fiber makes you feel fuller so you eat less. A great substitute for oil in recipes. Use pumpkin puree in place of a portion of the oil in your favorite bread and muffin recipes to reduce calories and lower fat. 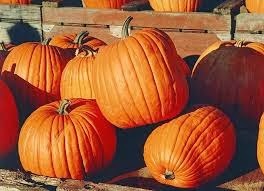 Pumpkin also boost your immune system, protecting you from a number of diseases. Here are just some of the health benefits of pumpkin touted by researchers. Fights cancer. The National Cancer Institute believes a beta-carotene rich diet protects against certain cancers. If you smoke (hmmmm), beta-cryptoxanthin, a carotenoid found in pumpkin, just may protect you from developing lung cancer. Reduces inflammation which can lead to chronic health conditions like heart disease or Type 2 diabetes. Cancer, too. Prevents blindness from age-related macular disease. Enhances your mood. The tryptophan in roasted pumpkin seeds promotes serotonin production to make you happy, happy, happy. Reduces LDL or "bad" cholesterol. Pumpkin seeds have this affect, apparently. Save some when you carve your pumpkin. Wash them, salt them and pop them in the oven… and then into your mouth. I was totally amazed when I read this report from our local hospital dietitian I think I am going to be eating more pumpkin. How about you? Check out the Celebrate Fall Hop....Hop is packed with info about Fall, Fall Recipes and DIY Fall Projects. 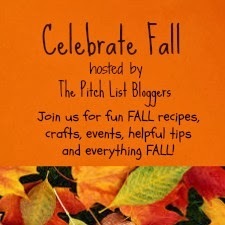 Check out the many fun Fall post and if you have a fun Fall post ~~Add your post to the linky! I didnt know this information! Thank you so much for sharing! I have always loved pumpkin. I just didn't know it was soooo good for me. I knew they had to be good for us, but I didnt know why! I have always loved pumpkin, I like to use some in my mix of smashed potatoes/sweet potatoes. So good! Great information! I knew I loved my pumpkin soup for a reason . Thanks! Really good reminder about the benefits of pumpkin! I need to find more ways to sneak it into our diet...and not just those sugar loaded (but yummy) desserts! Thanks for the info! Pumpkins are also, apparently, really easy to grow. We have a random pumpkin growing in our back yard right now. We have no idea how it got there as we don't recall ever throwing pumpkin seeds out and we didn't plant any! wow I didn't realize how useful pumpkins were - thanks! i love pumpkin! i love eating it to help with my inflammation! I think I need to eat more pumpkin! Good information! Great Info.. I may need to add something pumpkin to my diet this year. I just use it for pies. I had no idea that pumpkins could help you in the weightloss department. I desperately need to drop a few pounds so I'm off to purchase pumpkins! Thank you! Wow, I didn't know so many of these things. I just really love them for decorating and baking. The lovely orange color makes me smile and I personally love pumpkin muffin, pumpkin cheesecake - oh just about anything with pumpkin in it. This is great information about pumpkins! I love pumpkin so much and these facts just make them even better in my opinion! I didn't know most of that! I LOVE everything pumpkin so it's nice to know it has so many benefits as well. Adds to my list of justifications! Pumpkins are great for you- and a great recipe addition. We make lots of baked goodies with pumpkin this time of year! Good info. We love pumpkins! I recently made pumpkin muffins. There is so much information I had no idea about. It's good to know that it fights LDL. I never really thought about pumpkin being low-cal,probably because I combine it with high-cal stuff too often. That's so good to know though! Pumpkins are chock full of healthy nutrients! Wow, I love pumpkins for the seeds, decorating, and more! Thanks for the info! I love pumpkin - only started eating it recently, but I love roasting it or even in desserts! This is great information on pumpkin. We definitely try to eat it a lot when it is in season. I had no idea they were so good for you!! Thanks! WOW! I had no idea! Thanks for posting this... we're going to be eating more pumpkin around here! We're going to get our pumpkins (for eating) tomorrow! They're always marked down super cheap at our local farmstand the day before Halloween! I knew there was a reason I love pumpkins! No one ever talks about the health benefits of pumpkin like you did here. Thank you for sharing this information. I just learned some new facts about Pumpkins..thanks for sharing! I've been trying some new pumpkin recipes lately, and coming up with some of my own too. I love pumpkins. I really had no idea they were THIS healthy thought!